Do you want to know the trick to super tender and incredibly moist souvlaki chicken? Brining is a fantastic way to lock in moisture. The sodium and chloride ions penetrate deep into the meat, changing the proteins so they hold onto moisture more effectively – which means you loose less of that juicy goodness during the cooking process. Seriously, how great is that?! Thirty minutes is all you need to brine these bite-sized pieces of chicken. Then toss them into an even faster marinade of lemon, garlic, olive oil, and oregano. The marinade doesn’t penetrate deep like the brine, but it does penetrate into the surface. With the brine/marinade combo you get locked in moisture on the inside with some serious flavor on the outside. My mouth is watering just thinking about it! Ideally you’ll want to grill the skewers but you can certainly cook them in a grill pan if you like. Both require medium-high heat and about 7 – 8 minutes of total cook time. Easy, right? Keep that in mind as you scroll down to look at the recipe. Go ahead, take a look. I’ll wait. Ok, ok, so you may be thinking what the (insert choice curse word here) is up with the super long ingredients list! Please don’t be intimidated. You are after all making 5 components for a complete meal. Rather than presenting you with a single entree and leaving you to figure out what sides to make, this recipe gives it to you all on one flavor packed plate. So let’s talk a little bit about what’s on this plate. I’ve already told you about the moist and juicy chicken with the wonderful garlic and lemon marinade. Well that marinade gets reused when cooking the rice and adds a truly brilliant lemony zest. The rice is then tossed with some toasted pine nuts giving the rice enough flavor to stand out on it’s own. 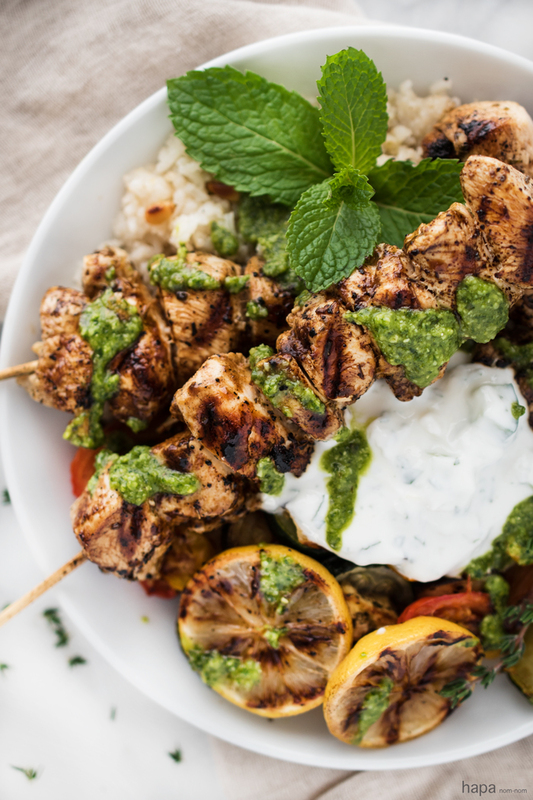 But it doesn’t overpower the other components of this dish – it pairs perfectly with the chicken, the simply roasted veggies, creamy tzatziki, and herbaceous pesto. Together the flavors of this Chicken Souvlaki with Lemon Scented Rice & Roasted Veggies play like a symphony in your mouth. 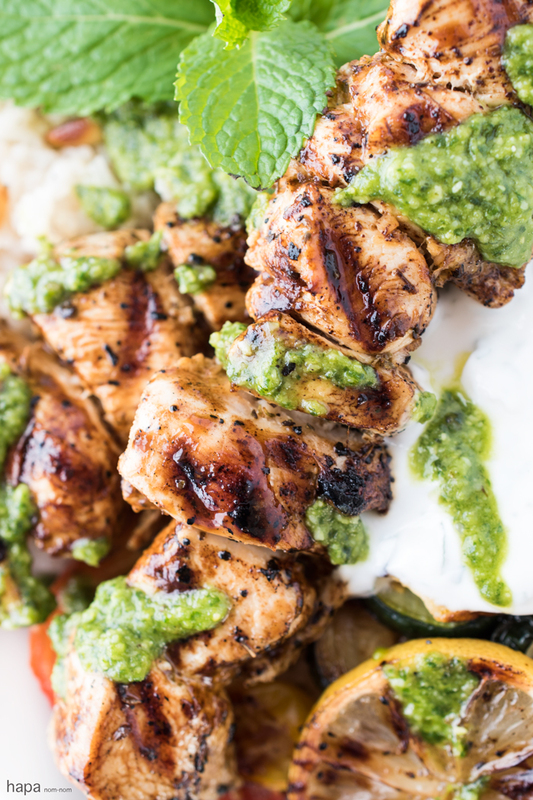 Chicken Souvlaki with Lemon Scented Rice, Roasted Veggies, Creamy Tzatziki, and a Drizzle of Pesto make this full plate flavor experience! If using wooden skewers, soak in water for at least 15 minutes. Combine the ingredients for the brine in a large bowl. Add the chicken and refrigerate for 30 minutes. Meanwhile make the tzatziki. Use a mortar and pestle to mash the garlic and salt together until it forms a paste. * In a large bowl, combine the yogurt, tahini, mint, and lemon. Add the garlic and salt mixture and combine well. Finally fold in the cucumber. Refrigerate until ready to use. To make the pesto. Add to the bowl of a food processor, the basil, garlic, pine nuts, and parmesan. Pulse while slowly adding ½ cup olive oil until smooth and desired consistency. Add salt and pepper to taste then pulse a few more times to incorporate. Set aside and keep at room temp if using soon. Combine the ingredients for the Quick Marinade in a large bowl. After 30 minutes, remove the chicken from the brine and rinse well under running water. Add the chicken pieces to the Quick Marinade and toss to coat. Allow to soak for about 5 minutes, then thread the chicken on the skewers and keep the marinating liquid for the rice. Allow the chicken skewers to rest on a plate while you prepare the lemon scented rice. In a saucepan, bring the water and the reserved Quick Marinade to a boil. Add the rice and salt, bring to a gentle simmer. Give a quick stir, and then cover with a lid. Reduce the heat to low and cook for 20 minutes. Uncover, allow the rice to absorb any small amount of remaining liquid. Then fluff with a fork. Toss in the toasted pine nuts. While the rice is cooking, prepare the roasted veggies. Line a large baking sheet with parchment paper. Add the veggies and drizzle with olive oil. Sprinkle with the thyme and a little salt and pepper. Roast for 30 minutes, turn the veggies occasionally. While the veggies are roasting, heat your grill or grill pan over medium-high heat. Coat the grates or the pan well with oil. Once hot, shake off the skewers of any excess marinade and add them to the cooking surface, working in batches if needed. Cook for 7 - 8 minutes until the chicken is done, turning once. To plate, add the Lemon Scented Rice and Roasted Veggies to a plate or bowl. 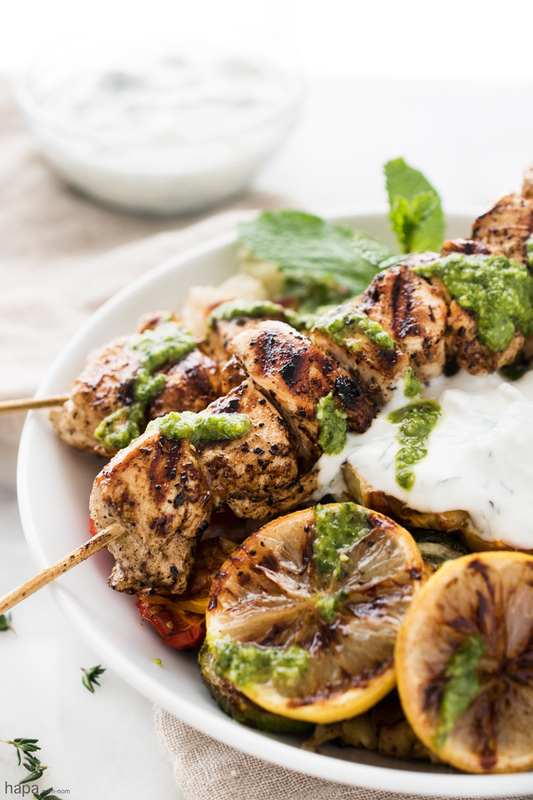 Top with a few skewers, a dollop of tzatziki, and drizzle with pesto. Serve and enjoy! * If you do not have a mortar and pestle start by finely mincing the garlic. Sprinkle the garlic with salt and then tilt the blade so that it forms a shallow angle with the cutting board. Scrape the knife across the garlic repeatedly, until it forms a paste. ** To make this dinner come together more quickly, you can always make the tzatziki and pesto the night before. many things captured my attention in this post: 1) crazy adore you marriage of flavor profiles by splitting the marinade between the chicken and rice. 2) considering the number of dry pieces of poultry and pork i have eaten in my time, the glory of proper brining needs to be in everyone’s back pocket. i dig how you showed the brine does not have to be overly salty or full of flavors other than that which is needed to moisten the meat. 3) your tzatziki has tahini and mint? mind blown and am 4sure making that even before i make this dish (aka tonight to eat with chips as i snuggle with jimi and watch netflix). 4) i believe everyone needs to grill lemons on a daily basis. I have not actually had the chicken souvlaki cold. That being said, I am notorious for eating cold leftovers and enjoying them as much as if they were warm right off the stove. My mom tells me that’s the Swedish side of me 😛 My husband looks at me like I’m crazy. OH HELLO my FAVORITE FOOD ON THE FACE OF THE PLANET! Isn’t it just the best cuisine! Seriously, I could eat it everyday! I haven’t tried brining but I am intrigued….I need to give this a try! You know what? I don’t think I’ve ever brined a piece of meat and I almost never cook chicken breast (unless it’s attached to a whole bird) because I always jack it up and dry it out. I’m totally trying this! I fixed this last night and it is every bit as delicious as it looks! Thank goodness there is enough for us to have leftovers tonight. Can’r wait! This sounds fantastic! I love the idea of brining the chicken. I need to make this! Made this for company last night. Simply delicious. I ended up using white meat and it was moist. Followed your directions exactly even your grilling tips and it came out perfectly The sauces and sides were amazing. Definitely making again. Where are the leftovers??????? Oh my gosh, Lyn! I’m SO thrilled that you and your guests enjoyed the dish! Don’t you just love how brining keeps the moisture in even when you’re using white meat?! Next time you make it, I would LOVE to see your picture! Looks tasty!! I was just reading about brining chicken yesterday. I really need to try it! Kathleen, oh my gawd, this chicken souvlaki looks freaking amazing. . and YES to the brining!!!! We should just brine everything huh? I feel like the only time I brine is Thanksgiving for the turkey. . thanks for the reminder! love this! Wow! Kathleen, this has got to be the ultimate souvlaki (and I’m a BIG fan of that!). I’ve been eating veggie soups all week (tooth problem!) and could kill for a bite or 20 from this plate right now. This is soooo my type of meal!!! And I love that you talked about the chicken and brining!!! It really is an incredible way to eat meat! It’s the only way that I ever make my turkey! I love the pesto on this!!! Ahhh and the pics! This is so gorgeous and just screams EAT ME! I wish there was a way other than brining to keep the moisture in chicken breasts. I’ve found that brining leaves the meat way too salty for my taste. Apart from that this recipe sounds really nice. Hi, Susan! I’m so sorry I’m just responding now, I’ve been at a jam-packed conference out of town. Love the trick to super tender and incredibly moist souvlaki chicken. Thank you for sharing. My mouth is watering by looking at these skewers. So vibrant and delish. I love brining! it’s such a quick and easy way to keep lean meat moist! I will definitely be implementing this trick over Thanksgiving.